The Loop Elevated was built in sections over four years, and likewise each leg's franchise was secured separately and in its own unique way. The franchise for the Fifth Avenue [Wells] leg of the Loop was obtained in the name of the Northwestern Elevated Railroad from Michigan [Hubbard] Street to Harrison Street, a distance of one mile. Frontage signatures (required from business owners on the street to allow construction according to the Cities and Villages Act) were not as hard to get on the Fifth Avenue side as on other legs since many businesses along Fifth at this time were factories or other warehousing or industrial establishments who were eager for the "L" to be built, offsetting the retailers who resisted the structure's presence. On June 24, 1895, the City Counsel granted the Northwestern a 50-year franchise to build on Fifth Avenue. Rights south of Lake Street were immediately reassigned to the Union Elevated and construction of this leg of the Loop began on August 31, 1895. Quincy station was completed in 1897 and opened along with the Wells leg of the Loop for business on October 3 of that year. Each leg of the Loop also had a unique station architectural style and design, although those on the Wells and Wabash sides were very similar. Quincy and the other Wells station houses were designed by architect Alfred M. Hedley in 1896 in a Neoclassical style with Palladian influences. The station featured two track-level station houses, one for each platform. Executed in painted sheet metal, the exteriors of the station houses featured ornate, almost Baroque window surrounds, Corinthian pilasters and cartouches along the roof line topped by hipped roofs with scrolled finials. 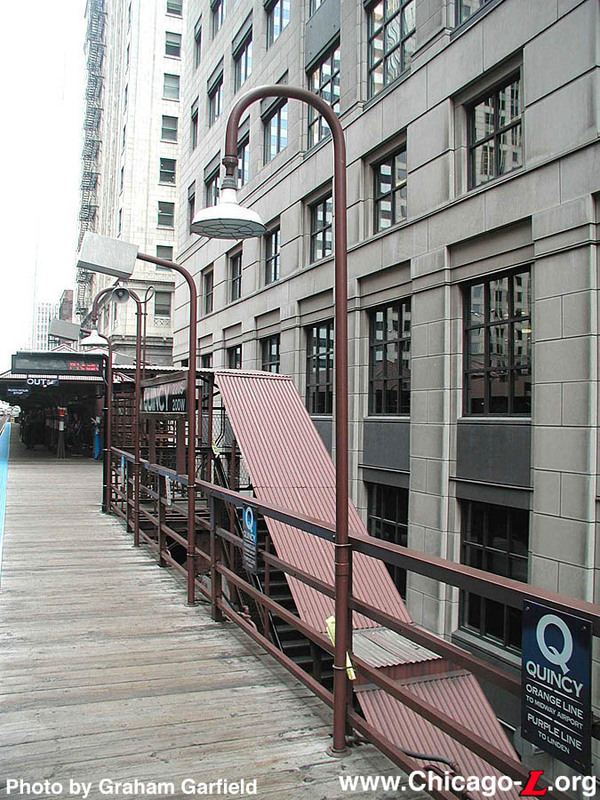 Stairs on each of the four corners of the intersection of Quincy and Wells led to a mezzanine level, including a walkway over the street connecting the east and west sides. From the mezzanine level, stairs led into both of the station houses and to the platforms (the latter for exiting only, initially controlled by "slam gates" and later by rotogates). The station houses were very small, limited by the narrow width of Quincy Street. The interiors of both the Inner and Outer Loop station houses featured wooden floors, pressed tin walls, and tongue-in-groove wooden wall paneling. 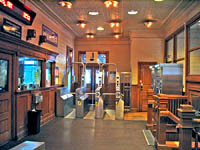 The ticket agents' booths were integrated into the trackside elevation of the building, with windows and doors from the booth both inside the station house and onto the platform. Originally, the separate "L" companies did not offer free transfers and separate facilities were maintained for each company's trains. On the Loop, each platform was divided in half, with a barrier in the center, to partition the platform into two separate berthing areas. Likewise, there were two ticket agents in each station house, one for each "L" company, and separate paid areas were maintained within the station houses for each company. If one wished to transfer from one company's train to another's, they had to enter the station house, pass by an agent again, and pay a second fare to gain access to that company's paid area. 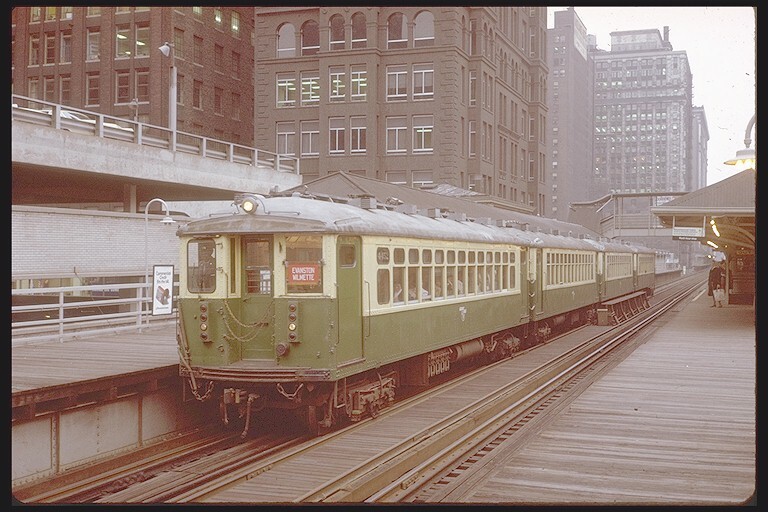 Originally, on the Inner Loop side, the Metropolitan "L" stopped at the south end and the South Side "L" used the north berth; on the Outer Loop, the Northwestern Elevated used the north half while the Lake Street "L" was assigned to the south berth (the Loop originally operated as a left-handed railroad). After universal transfers were instituted in 1913, these barriers and separate paid areas were eliminated and passengers could pass by any agent and use any door onto the platform and still access their desired train. Within just a few years of opening, the Loop's ridership had soared. As the tracks reached their capacity limits, travel times increased and congestion became a problem. 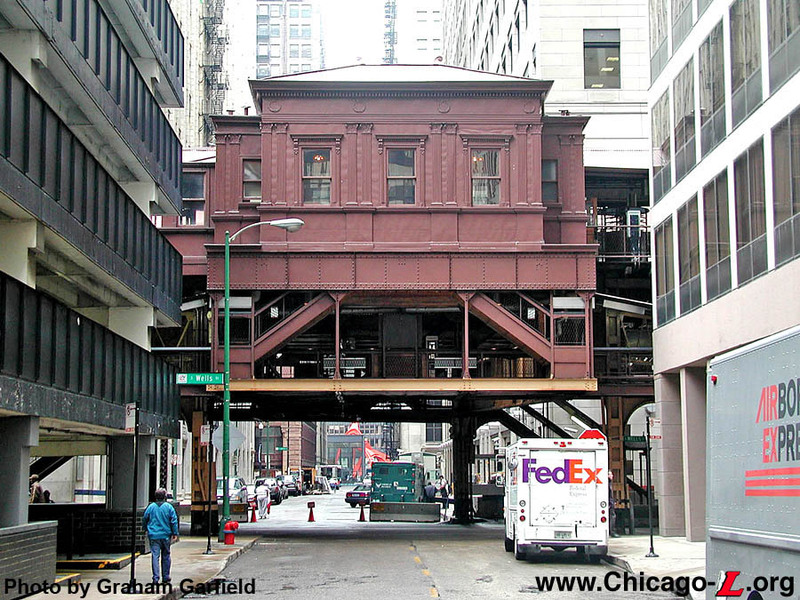 In May 1903, permits were obtained from the city to extend the platforms on the Wabash, Van Buren, and Wells stations. By September, the structural steel was in place, with just the wooden decking, railings, and lights remaining to be installed. However, at that time, the city halted all work, engaging in one of several periodic disagreements between the city government and the elevated railroad companies, usually hinging on some arcane aspect of the franchise's wording and designed to exact political gain by allowing the city to appear tough on the traction interests and robber barons. Unfortunately, this particular squabble could not have come at a worse time, as congestion mounted and little relief was in sight. These extensions were not completed until 1913, after the "L" companies had voluntarily consolidated and agreed to through-route trains and provide free transfers. 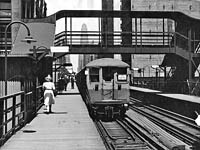 The 1913 through-routing and Loop platform extensions did not entirely eliminate the congestion and in September 1924, the newly-merged Chicago Rapid Transit Company embarked on a $5 million improvement project that included further lengthening Loop station platforms. Work proceeded rapidly and by 1930, the platforms extended south of Jackson Boulevard and north of Adams Street, a length of roughly two blocks. The expansion project also included numerous auxiliary exit stairways, wooden windbreaks, and a canopy addition at the north end of both platforms. These canopies were of a different design than the originals but were typical of CER/CRT canopy design from the early 1900s through the 1940s, featuring a gently curved roof with side support columns and latticed framing. The platform extensions also had simpler railings. 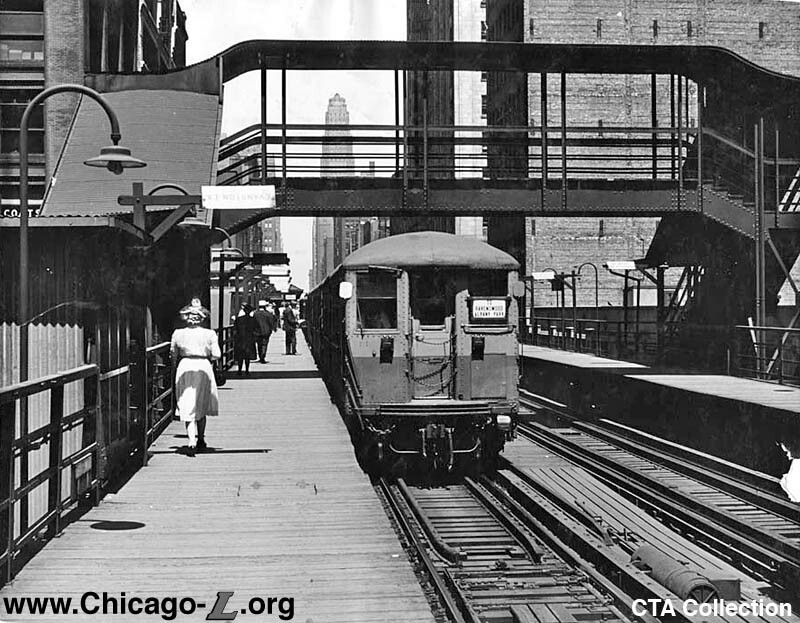 In 1927, a new Wells Street Terminal was completed on Wells between Jackson and Van Buren, serving trains of the Chicago Aurora & Elgin interurban and overflow "L" service from the West Side. The impressive three-story terra cotta building included a transfer bridge from the third story to Quincy station's Outer Loop platform, opening soon after the terminal's completion, so that passengers could transfer from the Loop to the terminal without exiting to street level. An overhead transfer bridge was also installed at the south end of the Quincy platform, near the accessway to the Wells Street Terminal, to allow transferring passengers easy access between the Inner Loop platform and the Outer Loop platform (where the bridge to the Wells Terminal was located). Eventually, the platforms were lengthened to the point where they met the platforms from Madison/Wells, the next station north, and there was one continuous platform from Randolph/Wells (ending close to Lake Street) on the north to Quincy on the south (ending north of Van Buren). 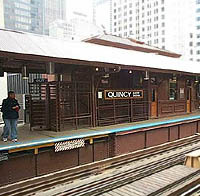 After the CTA took over operations of the "L" further modifications were made to Quincy station. 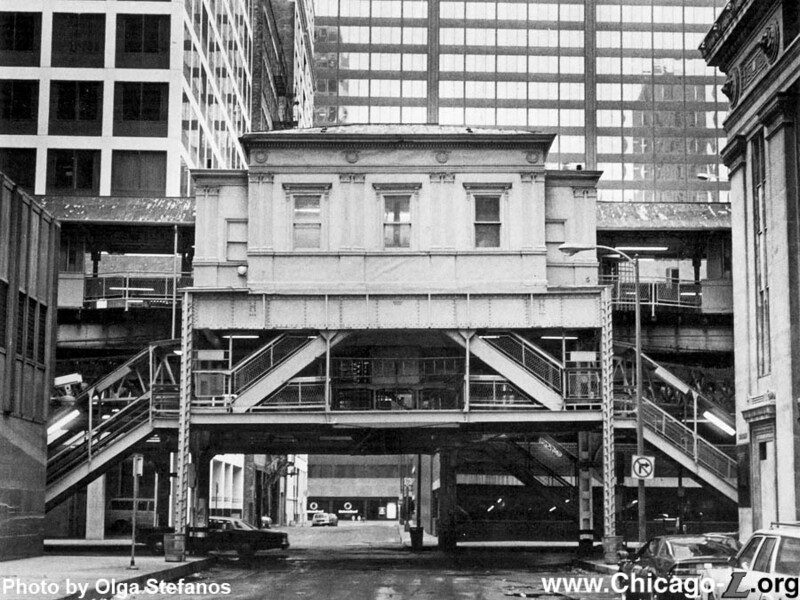 In December 1968, the CTA blocked off the unused portions of the continuous platforms on both the Wells and Van Buren legs of the Loop. 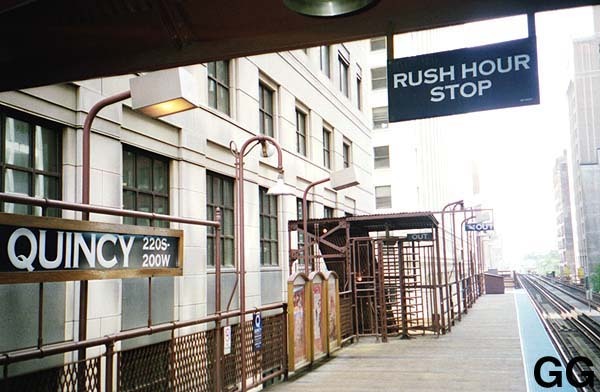 Not long after, the Wells Street Loop stations to were returned to individual, noncontiguous facilities, removing the needed portions of the continuous platforms. Some of the platform extensions remained, however, with the platforms extending from Adams to Jackson. The auxiliary exit stairs in these section, except for those on the Outer Loop platform near Jackson, also remained. Over time, plexiglas windbreaks were added to the platforms and all of the incandescent lights in the station were replaced with fluorescent lights. Some of the pressed tin inside the station houses and in the mezzanine was patched or replaced with smooth metal. 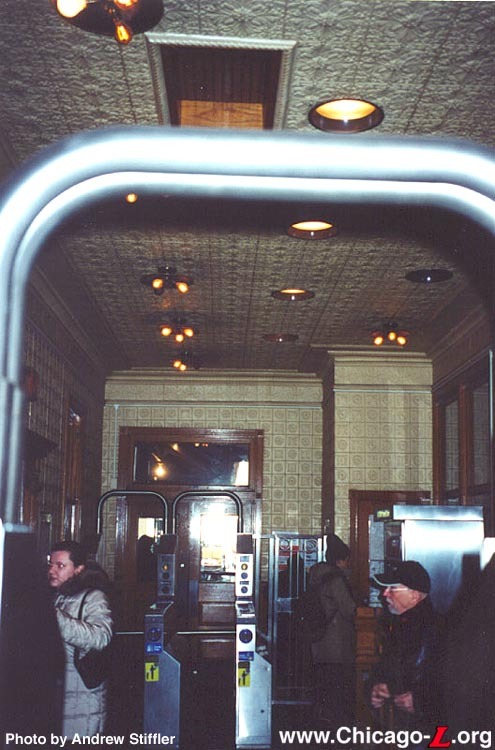 Modern turnstiles were also added to the station houses, although it should be noted that as late as the early 1970s there were no agent-controlled turnstiles at the agents' booths. 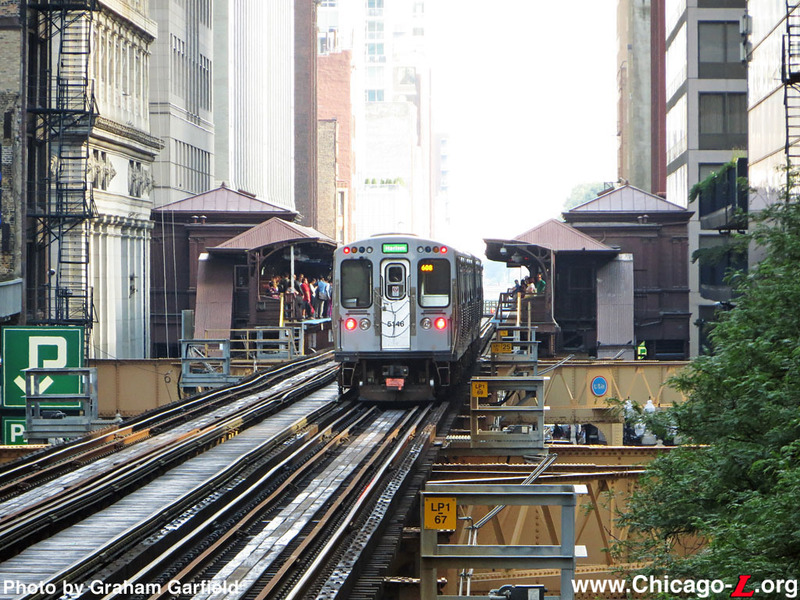 After plans to replace the Loop Elevated with a series of subways were laid to rest in the early 1980s, the City of Chicago and the CTA set about rehabilitating the Loop Elevated, which had received deferred maintenance in anticipation of its replacement. 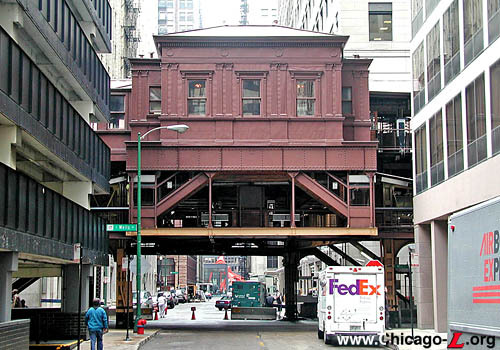 Around the same time, the Loop Elevated was also determined to be eligible for the National Register of Historic Places. Designation as being eligible for the National Register places the same protections on a public buildings whose maintenance and renovation use federal or state monies as actually being on the Register, per the National Historic Preservation Act of 1966. 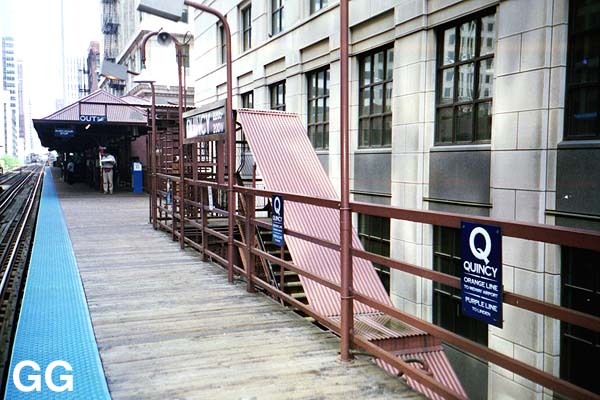 In addition, an agreement between the CTA and the US Department of the Interior and the Illinois State Historic Preservation Office (SHPO) protected the Loop Elevated structure but only required the restoration of one station, Quincy. (One other station, Adams/Wabash, was to be retained and rehabilitated but significantly modernized. All of the other stations would be rebuilt and some relocated.) The agreement provides specific protections for the station's historic elements. 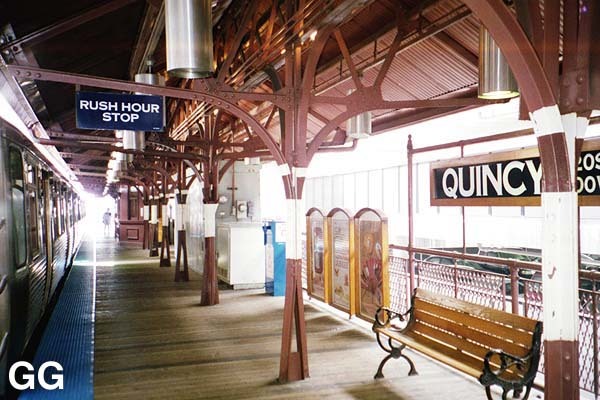 Chosen because it was one of the few surviving original Loop stations and the one that retained the most historic integrity, Quincy was to be restored as close to its original 1897 appearance as feasible, while maintaining capacity for current ridership and adhering the modern safety and security standards. The preservation-sensitive restoration was led by the Office of John Vinci, Inc., including the replication of the ticket agent's booth from the original 1897 drawings. Countless layers of old paint were scrapped and stripped off the structure, with a new coat of paint applied in what was believed to be the original color. Unfortunately, it was later discovered that it was painted the wrong color; the one they used was actually the original primer color. Apparently, the analyst went through too many layers of paint to find the 'original'. Shepherd's crook incandescent light fixtures that imitate the originals were created and installed, though they are alternated with modern sodium vapor lights (presumably because the incandescent didn't provide a satisfactory amount of light). Reproduction blue and white enamel signs were installed (albeit using a fancier, more 'antique' typeface than the originals had) and wooden advertisement cases were put up with reproduction Victorian advertisements. The interior retains its pressed tin walls and ceiling and tongue-in-groove chair-rail wood paneling. Most is original and what was damaged or missing was recreated. New replicas of the oak doors and moldings were created and installed. 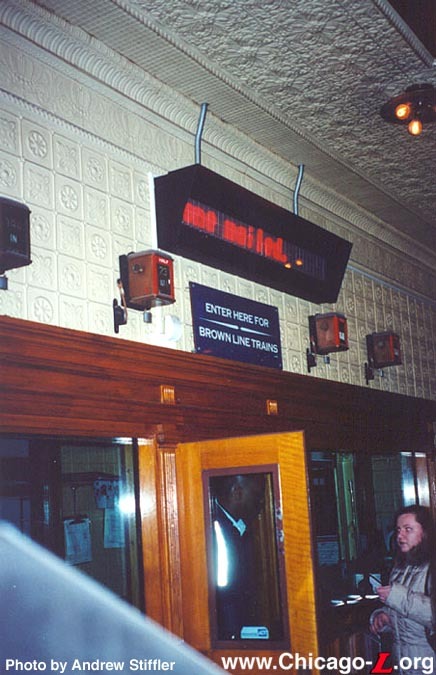 The original fare collection booths are still in place, as well as old fare register equipment. A variety of different lights were installed in the rehab. Under the canopies, rows of individual incandescent bulbs were installed, but these amounted to little more than "mood lighting" for a couple reasons. First, they simply output a moderate level of light. But, more than that, they were not installed the way the original incandescent bulbs were. Rather than two rows along each edge of the peaked canopy (e.g. one along the tracks and one along the back), with the bulbs pointing down onto the platform, a single row was installed along the center lattice, with the bulbs pointing up into the peak of the darkly-painted canopy, thus allowing little of this light to actually reach the platform. To supplement these, two rows of stainless steel light "canisters" (looking not unlike the stainless steel ashtray stands one might see in a hotel or office lobby) were hung under the canopy, each row about two feet in from the edge of the canopy. Looking obviously modern and out of place with the restored station, they were supposedly chosen by the design consultant retained by the City to create a lighting scheme for the station precisely because they looked obviously modern. Apparently, the consultant thought it best to let the public know what was restoration and what was an addition. Outside of the canopies at the far south end of the platforms, two types of lights were installed. One set of lights approximated the original shepherd's crook lights with their curved poles and "pie pan" porcelain enameled light shades. They were not exact replications and differed in several ways, including the bend radius of the pole (the curve should be a bit gentler), the distance from the bottom of the bend to the light fixture (in the historic lights, the shade was closer to the bottom of the bend), and the shape of the "pie pan" shade itself (the real shades were a bit shallower and had a slightly different shape). Perhaps the biggest difference was in the illumination itself: the original historic lights had two or three bulbs each (alternated between two and three bulbs because each was 120 volts and they fed off the 600v third rail, so they were wired in series such that a set of two poles would together equal a set drawing 600v; most "L" station lights are now AC powered). As such, they cast more light (two or three times as much, theoretically) onto the platform than the reproduction lights with their single bulbs. To supplement the reproduction historic lights, they were alternated with modern sodium vapor "shoe box"-shaped lights on angled poles, which were the standard station light at the time (and can still be found everywhere around the system). As with the lights under the canopies, these lights strongly contrasted visually but were felt to be a compromise between historic restoration and modern necessity. The project began in November 1985 and required the station to close during the extensive project. The closure was expected to last only four months, but ended up lasting about 2-1/2 years. The station did not reopen with its restoration complete until February 1988. The Urban Mass Transit Administration (UMTA) provided the money for the restoration. The Quincy project was projected to cost $2.25 million, substantially less than the $3-5 million that the other Loop station renovations were at the time projected to cost since no elevators or escalators were to be installed at Quincy. During a later renovation project (see below) and in the year of the "L"'s 125th anniversary, the Quincy station was also made an official Chicago Landmark. 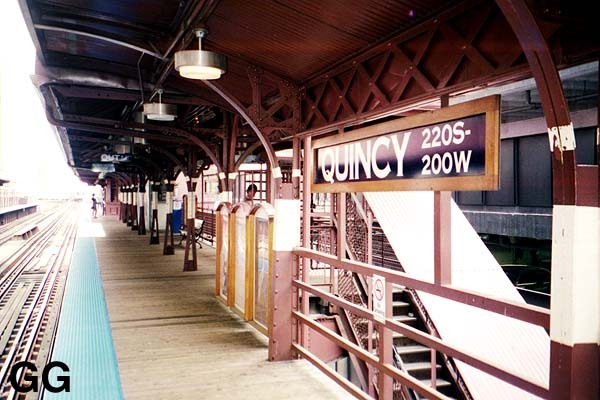 The city's Commission on Chicago Landmarks voted in July 2017 to move forward with the local landmark designation process for the Quincy station. The Commission's recommendation was then forwarded to the City Council, where the Committee on Zoning, Landmarks and Building Standards addressed the proposal at their November 8, 2017 meeting. Quincy's local landmarking was made official by the City Council on November 21, 2017. If you want a glimpse into the "L"'s past, this is it! 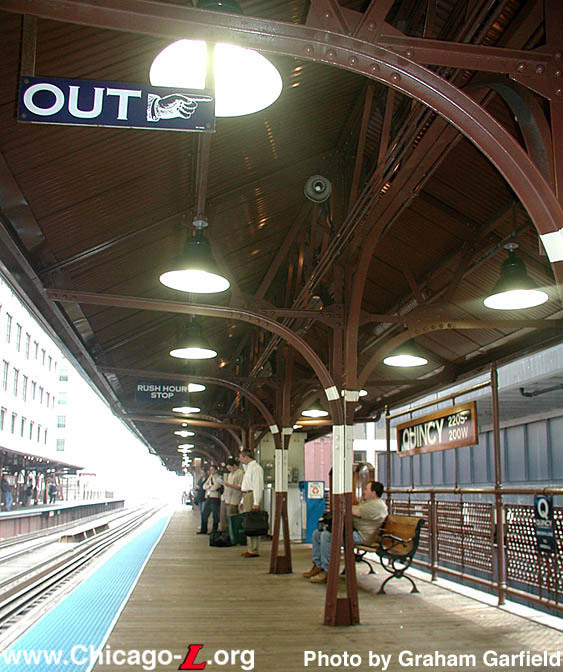 In the spring and summer of 2003, the CTA engaged in a project to enhance the lighting at Quincy station. 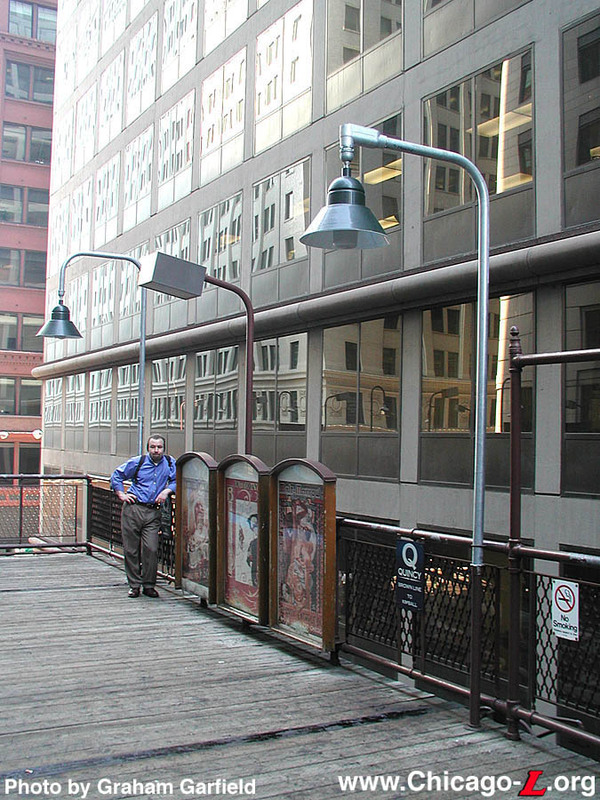 Fifteen years after the station was renovated, the lights installed in the 1985-88 project had not aged well. The "historic" lights continued to cast insufficient illumination and their modern counterparts had not kept up, generating less and less light. Taking their visual cue from Library station (which is not historic, but does have a "historic" feel, look, and visual vocabulary), a new light was chosen with an angled shade, dark exterior, and white underside for maximum light reflection (as the original, historic lights had). The size, pitch, depth and angle of the shade was not an exact match for the original platform lights, however: although it generally mimicked the look of the historic "goose neck" lights, they were clearly not the same design. Initially, one or two of the new metal halide fixtures were tested on the Outer Loop platform just south of the station house, next to the exit rotogate. Then, in June 2003, all of the under-canopy lights were removed and replaced with the new fixtures. First the Outer Loop platform was completed, then the Inner Loop was done. The under-canopy project was completed in a matter of days. At the same time, the lamps were also installed in the mezzanine above the street. Previously, in Spring 2003, the lights in the stairs from the street had been replaced with modern fluorescent light boxes with squared backs and 45-degree angled fronts, which often are installed at the corners of walls and ceilings (in subway stairways, for instance). Following the under-canopy project, two prototype light poles appeared on the Outer Loop platform, immediately south of the 1897 canopy, in early July 2003. The two fixtures use the same lamp and shade as under the canopy, but each use two slightly-different, new poles. Neither pole, however, is an accurate representation of a historic "L" station gooseneck light post. Those at Library are closer in shape and design, although they too are obviously modern. No additional lights were so modified and the station lighting has remained in this configuration since 2003. Due to severe deterioration, the CTA refurbished all of the historic advertising frames and posters on the platforms at Quincy, which were reproductions dating from the station's restoration in the late 1980s. The wooden cases were all replaced or refurbished, and the cardboard posters were replaced with new, heartier fiberglass graphics. Some of the posters were replaced in-kind, while others were replaced with different graphics either because the old ones could not be found or were deemed historically inappropriate to the period or venue. Many of the new posters are from the series of advertisements the Insull electric railroads did in the 1920s to promote destinations and attractions along the line. The new posters and wooden cases were installed in late April 2011. 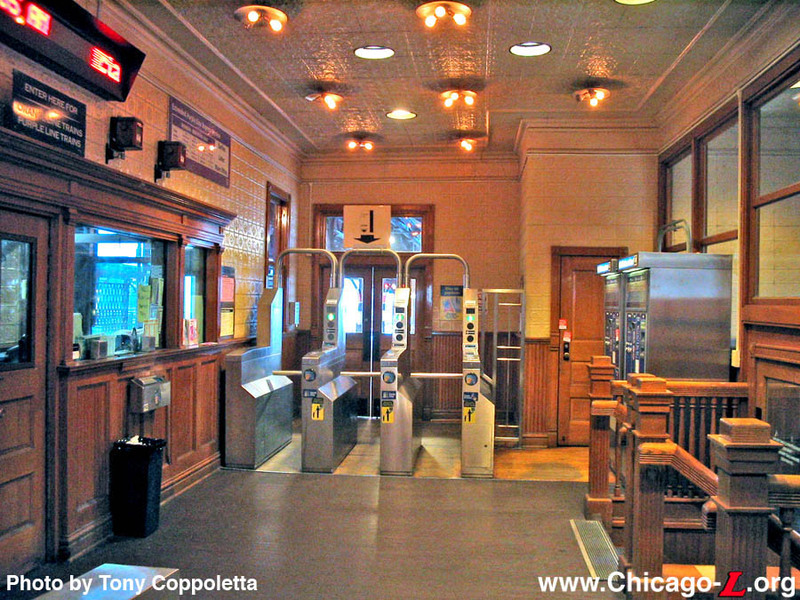 On August 14, 2013, the Chicago Transit Board approved a plan that would use $15.7 million of City tax-increment financing (TIF) funds to make the Quincy station accessible to customers with disabilities. Improvements will include the addition of two elevators, the replacement of two sets of entrance stairs, as well as painting, lighting improvements, and other repairs, while retaining the historic appearance of the station. Renewal work will include refurbishing station surfaces, including woodwork, doors, railings, ceilings and framing.1 The station house wood flooring was replaced with tile with a wood grain design. for improved durability while maintaining a reasonably historic look--keeping the wood flooring in good repair was a challenge due to the high foot traffic and deterioration caused by water and snow tracked in and left standing on the interior-grade wood. The elevators are to be set away from the vintage station houses so as to not interfere with their architectural integrity or the public's view of the historic structures. They will be connected to the station houses via an enclosed walkway at platform level, but separated from the platform, connecting to the station house through a new opening in the exterior wall to provide access to the unpaid area of the interior. 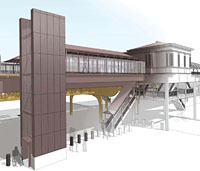 The elevator and walkway are to be of a modern design, but using muted forms and a brown color similar to the rest of the station so they minimize their visual impact on the historic surroundings. In keeping with the historical look of the station, the elevator tower exteriors panels have an ogee pattern that mimics the station's historic railings. The Quincy station is located in the LaSalle Central Tax Increment Financing District. The total project cost is $18.2 million. 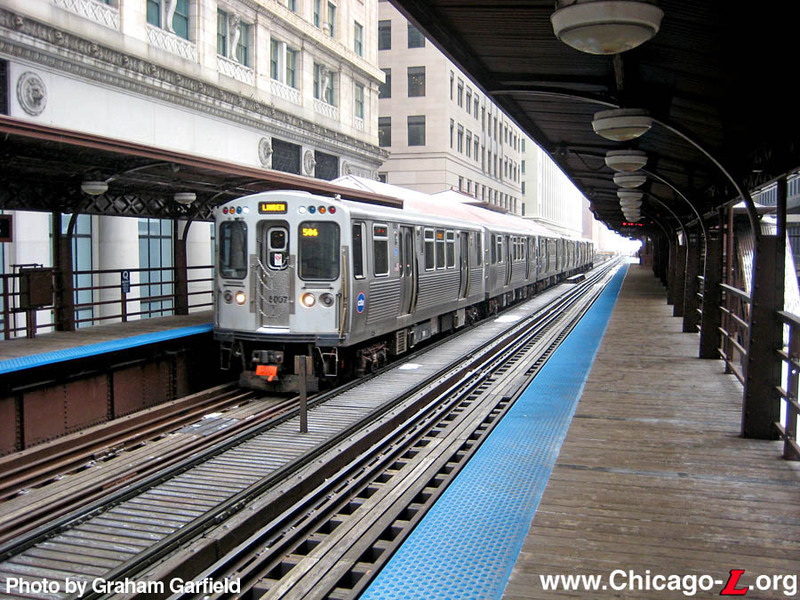 On June 8, 2016, the CTA's Board awarded the $11.7 million construction contract for the Quincy Loop Station Upgrade Project to Ragnar Benson Construction, LLC. Ragnar Benson has done previous work for the CTA, including the Loop track renewal project in 2012. Ragnar Benson was given notice to proceed (NTP) for the project on July 27, 2016. The southeast stair was closed on Thursday, March 16, 2017, and subsequently removed by CTA Ironworkers. The stairway needed to be removed to allow construction equipment access to the area around it to excavate and install the foundations for the elevated walkway to connect the new east elevator to the station house. The stairway was also refurbished while it was removed. In mid-May, installation of new temporary street lighting was underway and completed in June. During June, rock core testing was being performed on east side of street and micropiles were being installed for the new elevated walkway to connect the elevators to the station houses. The foundation for the east elevator tower was being excavated, while the buildout of the new foundations for new west exit stair near Jackson Blvd. continued. In July, work was underway on removing the deteriorated pressed metal ceiling panels in the mezzanine area for repairs underneath and eventual replacement. At 7am, Thursday, November 29, 2018, a new exit only stairwell leading from the south end of the Outer Loop platform to street level on was put into service. The elevators were placed in service at 5am, Friday, December 14, 2018, making the station accessible to customers with disabilities. 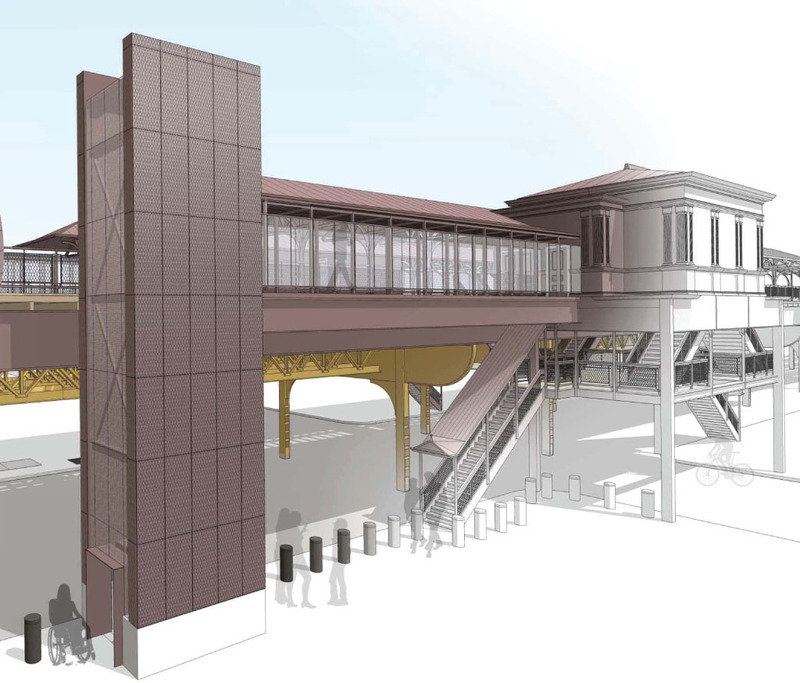 That afternoon, Mayor Rahm Emanuel and CTA President Dorval R. Carter, Jr. held a press event at the station announcing the completion of the renovation work at the historic Quincy station. An old-style (but not authentic) sign from the Quincy/Wells platform. 1. 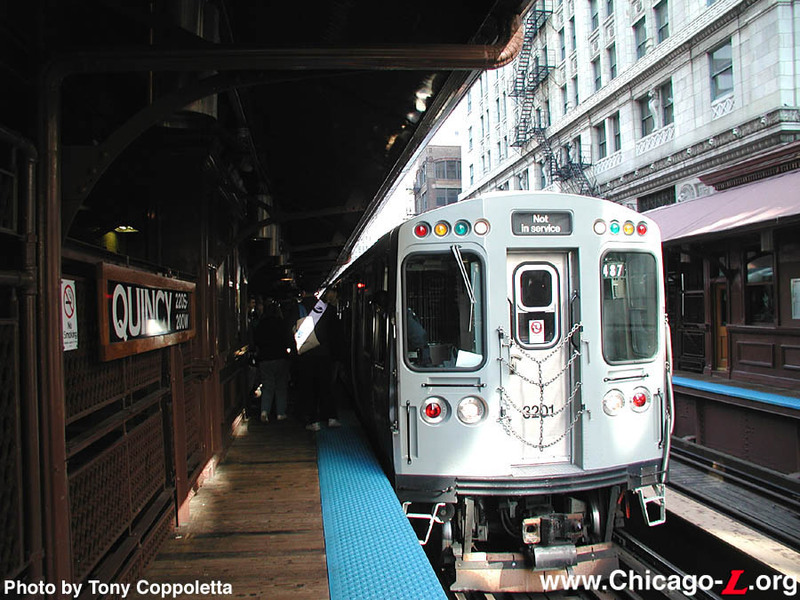 "CTA to Renovate Historic Quincy Loop 'L' Station." CTA press release, August 14, 2013.